For meringues, preheat oven to 120°C. (100°C. If using fan-forced oven). Whisk egg whites and a pinch of salt in an electric mixer until firm peaks form (3-4 minutes). With motor running, gradually add caster sugar and whisk until thick and glossy (2-3 minutes). Sieve icing sugar and cornflour over, fold to combine, then spoon 8cm diameter mounds onto oven trays lined with baking paper. Bake until meringues lift easily from trays and are crisp but not coloured (45-50 minutes), then turn off oven and cool completely in oven. Cut the pomegranate in half and remove the seeds. Cut the passionfruit in half. Break the meringue into bite size pieces. 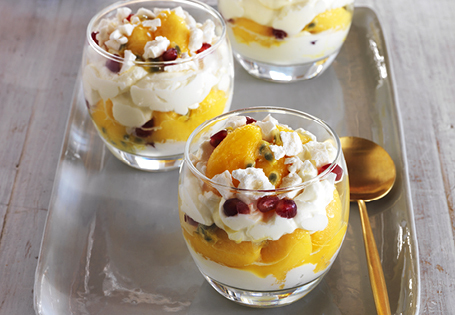 Take 4 clean glasses and begin to layer all the ingredients starting with the meringue and cream then layering with the mango, pomegranate and passionfruit. Continue to build until the glass is filled and garnish with mango, pomegranate and passionfruit.